We can't put a Play Folk play date in the books without an extra-lengthy blog post! I can't guarantee that this one will be as long as the others, honestly, because I don't know how to write about sports. Or play them. But I'll say this: we are 3-for-3 now with 20+ awesome people coming to play and 0 bad sports. This game more than any we have played or considered so far best embodies the spirit of our logline, "Recess reinvented," but an alternate would be: "The opposite of a Meetup." Because we, you know, actually meet up. Here's how the game went down. We'd been in touch with some friendly helpers who play Circle Rules Football more regularly, including the guy who is in touch with all the clubs around the world. This sport is popular in Brooklyn (of course) and Europe. 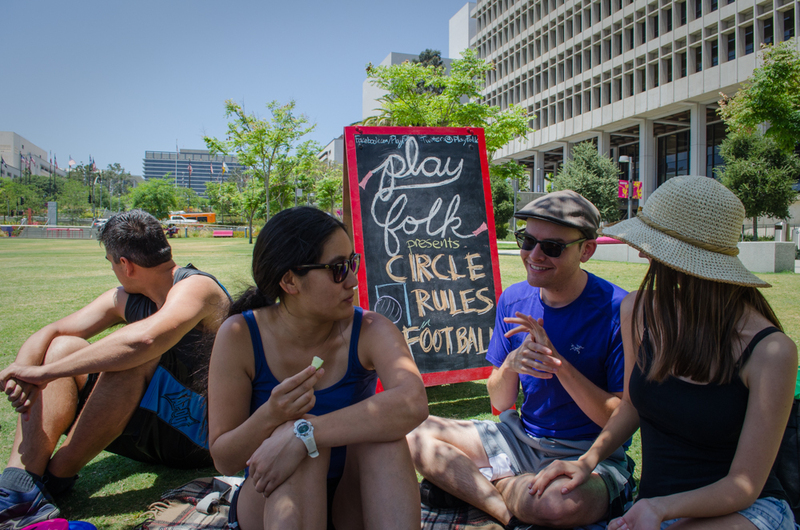 We had received support from the local commish of CRF in LA and we'd been in touch with Grand Park in downtown LA who had given us their blessing to play the game on the event lawn in the park. The morning of the game is when it dawned on us that we might be slightly underprepared for the game. I grabbed some extra supplies from the Wise Guys Events cave of wonders and picked Lily up from the Metro station. We carpooled downtown and met Willa where she had parked, some blocks away from the park: the nearest blocks were all coned off due to some event. The "goal" we had was simply the raw materials: some pieces of PVC and iron rebar, plus some deflated yoga balls. With some apprehension, the three of us schlepped the first load of props to the park and got set up. It was an insanely beautiful day and there were food trucks abutting the edge of the park where we'd been sanctioned to play. Before long, more club members joined us and, as we approached enough people to start playing, Willa and I returned to the lot to get the rest of the items. It turned out we were understaffed to carry the amount of weight, so Mac, Al, and Roman came to bail us out and help us carry all the gear. Once there, we jury-rigged the goal using the sandbags we'd carried from the car (that plus the flat of water were the heaviest items, but both were mandatory). Lily observed she'd stolen some traffic cones when she was in high school, and there were some lying around the park that we pressed into service. Ultimately, the goal got flimsier as the day wore on, and for the last couple points of the last game, Blake and a woman who was I think another friend of Erin's supported the goal physically. The answer to all problems, as usual, is Play Folk members. I'm happy to say that for the third straight game, we had about 25 people show up to take a chance on something new and strange. From left to right, sort of: Philip, our first rando, who rode his bike by looking interested and ended up joining and playing with us for the whole day; Asher; Siena; Willa; Mac; Myles; a friend of Erin's; Vanessa G. and her boyfriend; tall Ryan from Monterey; lifetime member Erin Dean being propped up by Roman on the right and another friend underneath; Joy in the front with Lily beside her; John Greg, Dash, another gentleman whose name I don't know, and Mike M.
When we had the equipment up, we gave out red and blue bandanas - at random - while I pulled up the rules on my phone and read them out loud. Nobody knew how to play. It is a rather simple game to learn, and the rules we didn't know we just made agreements about. CRF has a special coin toss called the "down up" that requires 2 contestants to put both shoulderblades on the ground and stand up: whoever does it fastest wins the coin toss. Clever Ryan from Monterey found a shortcut by doing a somersault! Lily and I reffed the first game and it became clear that there was a lot of athleticism on the field. Especially in the "key" which is the coned-off area surrounding the goal that only the goal tenders are allowed inside. It got quite physical in there, for two men who had never met before, but always good sportsmanship was obeyed. CRF is very fun to watch: the other people in the park certainly seemed to think so. You can do anything with the ball except hold it or sit on it, so you'd have someone dribbling a yoga ball and then someone comes along and punches it and then the person whom it lands near kicks it 4 stories in the air. Some of the most impressive moves were the penalty kicks: there is very little the goalie can do to defend against a yoga ball when someone kicks it 7 feet in the air and through a goal, but that is what happened several times. One athlete who really distinguished herself on the field was Vanessa Goh, whom I recruited after having seen her compete on the UCLA Quidditch team. Also tall Ryan from Monterey was a very fierce competitor, though always gentlemanly, and after he played the game twice he was eager to try it again, but couldn't get enough players for another go. On a warm day, when we were running all over the field, having the water was crucial, so it was good that we'd carried it from the car. Once more Willa brought Starbucks pastries for everybody, but she quit that job so the gravy train might stop one of these days. I guess it's fine: I don't like gravy on my cake pops anyhow. We were also lucky enough to get visits from Wale, who had played with us at Two Bit Circus. She wanted to attend the play date but wasn't able to because she was attending the TechLA conference downtown... which, it turned out, was across the street from the side of the park we were playing on. Crazy! She saw our Tweet and came by to say hi and get some photos and experience some of the game. Although the rules say that you play for 4 15-minute periods, we agreed unanimously to play to 5 points instead. After the first game, something of a runaway for the red team, we switched it up and got more people in the game. That second game was quite large, with 8 players on each team not counting 2 goal tenders. For the second, bigger game the goalies were Lily and her longtime friend Joy. Once more, things got real physical in the key: Lily kicked off her shoes and was not at all bashful about manhandling Joy. I will always remember Lily going, "It's open! Take a shot!" while basically sitting on Joy and the ball was nowhere near the key. You can see in the photo that the yoga ball isn't exactly fully inflated, which made the game very interesting. Willa thought the nozzle of the pump she'd brought didn't fit the yoga ball until I showed her the ball has a pin you have to pull out to inflate it. I told her I knew this because for the first 8 weeks of his life Fenton would not sleep unless he was being bounced on an exercise ball, so his mom and I became very familiar with them, and had very good ab muscles for a while there. I got to play in this game and though I am no athlete I had a great time running around, punching and kicking the ball when it came near me and sometimes bouncing it off my head, which was silly and fun. I made a couple helpful assists, even. This game was much closer and it came down to the final point, but the red team won. The red team won both games. Just like last month when we played Two Rooms and a Boom. What is going on? Get it together blue team! Mike and John Greg joined us in time for the second game, and Mike was very assiduous about guarding me. I was playing the game-theory version, keeping myself on whatever side of the key the fewest other players were on, but since Mike was on the other team and always shadowing me, it didn't work that well. Very canny Mike! After the second game it was pretty much just Ryan who was ready for more. The rest of us needed a break and some water, and to hang our sweaty disgusting headbands on the tree to dry out. They have since been laundered. Currently, Dash, Al, and John Greg have perfect attendance. So many good things were on display at this play date. The whole group helped with the tricky, flimsy goal, and understanding the rules. The cones we needed to make the game work materialized. Good sportsmanship was on full display. Plus for the first time, we had a rando: Philip, who happened to be riding his bike by, came and played with us for the whole day. Having seen photos of this game and knowing they play it at festivals and here and there, it was so gratifying to have the chance to play it with the sun on our faces and the breeze in our hair and fresh air in our lungs and a fine field day in LA's most beautiful park. Recess reinvented and revisited. Thanks to all of you who came to play: you are all going to nationals. Our next play date will be a sit and talky drinky game. Look forward to seeing you there.